In a study of 174 Seattle-area caretakers, house cleaners, and gardeners, local labor rights organization Working Washington found that local domestic workers are presented with similar struggles to those in other states and countries: They perform a high-risk job with few workplace protections. 85 percent of Seattle domestic workers, according to the study, would not be covered for an on-the-job injury. 54 percent don’t have health insurance—and only 6 percent get it from their employers. Domestic workers, including those in Seattle, are often at a higher risk for workplace violations, like sexual harassment and wage theft. 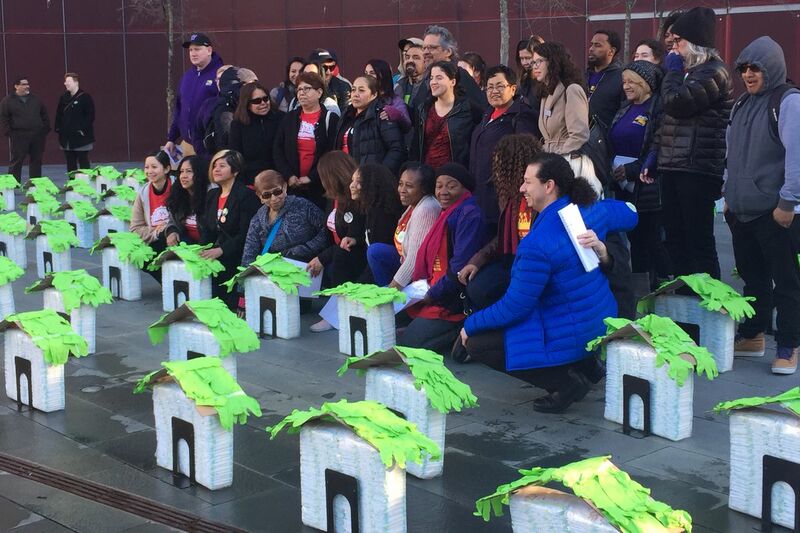 In an attempt to inspire the Seattle City Council to draft legislation instilling on-the-job protections—referred to as a Domestic Workers Bill of Rights—several groups and domestic workers built mini-houses on the steps of City Hall on Thursday, using gloves and diapers. Each diaper stood for one nanny in the Seattle area (approximately 8,000), and each glove-finger stood for each house cleaner (approximately 7,000). All diapers were later donated to Westside Baby, a social service agency in West King County that collects, inspects and distributes free diapers, clothing, cribs and safety gear for babies and children. Domestic workers comprise of house cleaners, home care for the old and young, gardeners, nannies, and cooks. 70 percent of domestic workers work directly for private households, sometimes paid in cash, rather than agencies. Following the demonstration, ralliers climbed City Hall’s steps to speak with the Seattle City Council Housing, Health, Energy and Workers’ Rights Committee about their experiences in the hopes of creating a Domestic Workers Bill of Rights ordinance joined by advocacy groups: SEIU 775, a union of long-term care workers; Casa Latina, which advocates, among other things, for the rights of Latinx workers; and Working Washington. Etelbina Hauser, who has been a house cleaner and in-home caregiver for 17 years, told a story of the time her male employer called out from the bathroom asking that she replenish the toilet paper while she was working. It was an odd request, but Hauser went to do it anyway. When she arrived with toilet paper, Hauser said, she found her male employer inside masturbating and smiling at her. Hauser said she later called his wife to say what happened and to quit. According to Hauser, the wife didn’t believe her, and refused to pay Hauser her remaining wages of $250. Hauser fought back tears as she recounted her story in Spanish for the committee, adding that this story was only one of three sexual harassment incidents that occured during her first three weeks on the job. Over two thirds of the domestic workers that Working Washington surveyed said they have never raised concerns with employers. Of those who have, 16 percent faced termination or retaliation for speaking up, like Hauser did. Wage theft can persist in these industries partly because many domestic workers work under the table, or don’t have written contracts with their employers. More than half of those surveyed by Working Washington don’t have contracts. For domestic workers of color, that number jumps to 88 percent without contracts. But having a contract doesn’t guarantee it’s followed. Michelle Manney said she had a nannying contract with a previous employer, a family, who repeatedly disregarded the agreements over the course of a few months last fall. Manney said that she reminded her employer weekly of needing tax paperwork, but nothing was done. The family also expected Manney to clean the home during vacations and take care of their father—even though Manney was not a certified homecare worker. All of this work was not listed in the contract. When Adelaida Blanco immigrated to the U.S. in 2004, she first worked as a cleaner. She described the work as physically demanding because it required long hours on her feet, hands, and knees as well as heavy lifting, like moving tables. One day as Blanco worked, she felt pain. A doctor later informed Blanco she was in the midst of a high-risk pregnancy and shouldn’t lift heavy things. Blanco said she alerted her employers but got no time off, and wasn’t offered an alternative. In part, Blanco said, she felt she had to prepare for the coming child, working to save money. Blanco then obtained a back injury during this time, putting her pregnancy at a higher risk for complications. But Blanco went right back to work after her unpaid leave, recovering from her on-the-job injury. Now, she said, she’s learning this type of treatment isn’t okay. “I’m raising my voice as a black domestic worker,” Blanco said. The majority of domestic workers—an estimated 95 percent, according to the American Community Survey—are women. The Pew Research Center found in 2014 that 45 percent of domestic workers in the U.S. are immigrants, both documented and undocumented. Many speak a different language at home. These factors uniquely position domestic workers at a higher risk of harassment, workplace misconduct and violations, discrimination, and abuse. 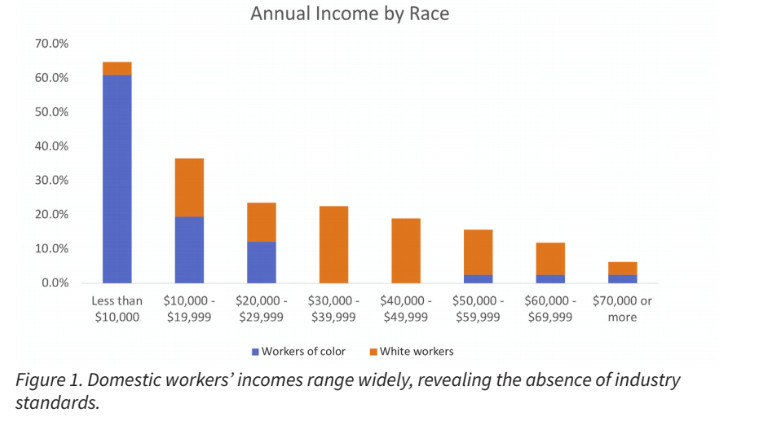 Working Washington’s survey found a stark wage disparity between white domestic workers and domestic workers of color. Caitlyn Heermans has been a nanny for nine years, most recently on Seattle’s Capitol Hill. Though she has a good experience under her employers now, she didn’t always. Historically, domestic workers have been excluded from labor laws that offer protection to the everyday worker. The National Labor Relations Act (NLRA), established in 1935 to protect workers’ rights to organize, strike, unionized and collectively bargain, came to fruition right when women began to infiltrate a workforce left unfilled during the start of World War II. But the NLRA explicitly excluded domestic and agricultural workers. The Fair Labor Standards Act (FLSA), regarding wages and overtime, came a few years later in 1938. It also excluded domestic workers. A 1974 amendment to the FLSA extended protections to some domestic workers but largely excluded the home-care industry. The Department of Labor narrowed these exclusions only two years ago. Now, only casual and live-in domestic workers remain unprotected. The lasting ramifications from these exclusions were detailed in the stories heard by the committee: In many cases, domestic workers can be fired for organizing, have limited ability to form federally recognized unions, have fewer legal rights to bargain for better wages or working conditions than in other industries, and have limited legal workplace recourse in court. In Washington state specifically, private households with fewer than two full-time employees don’t have to provide workers’ compensation, which allows incidents like Blanco’s to persist. This year’s new state-required paid sick leave also excludes casual labor and live-in workers. Many domestic employers hire only one person, limiting their legal obligation. Ty Messiah, a domestic worker, once nannied for a family that she said didn’t pay her the full amount of hours she worked. She said she had no sick leave and no insurance. Now, she said, she works for a different family with more benefits. The committee members—city councilors Debora Juarez, Lorena Gonzalez, Sally Bagshaw and Teresa Mosqueda—listened to the stories told in committee, although the meeting was a preliminary hearing before any proposals or legislation would even begin. Working Washington hopes that Seattle will emulate the likes of other municipalities who have implemented domestic worker protection laws. States with domestic worker protection laws on the books include New York, California, Hawaii, Illinois, Oregon, Nevada, Connecticut, and Massachusetts. Massachusetts’s Domestic Workers’ Bill of Rights was challenged in court, was appealed by their attorney general, and was eventually upheld last August, setting a potential precedent of particular interest to workers, activists, and politicians. The provided protections include minimum wage, overtime, workers compensation, unpaid maternity leave, payment for all time worked, and contracts. In Seattle, the eventual passage of a similar law looks promising.